When the Apple Watch launched we anticipated a backlash from the traditional Swiss watch makers. The Tag Heuer Connected was arguably the first great example of the old guard smartening up its approach to making watches. With Android Wear running the show, the Connected is the most expensive of the Google powered smartwatches, but remains one of the best we've used. The price tag invariably means comparisons are going to be made to the Apple Watch and whether it's justified to spend a bit more. So which one should you own? We've compared the features and our experiences with both to tell you how the circular Tag squares up to the rectangular Apple Watch. These two smartwatches are polar opposites in terms of looks, but are two of the most attractive to own for very different reasons. The Connected is one of the best looking smartwatches we've had our hands on and that's because it retains the design aesthetics of a traditional Tag watch. It's made from brushed titanium and has a 18-karat gold case and the size means it definitely feels more geared to male watch owners. It's water resistant like the Apple Watch, but that doesn't mean you should go swimming with it. You can switch up the straps as well, but unfortunately you can only swap in more rubber ones. With the Apple Watch, you're getting a rectangular OLED display that's sharper and more vibrant one than the 1.5-inch LCD screen on the Tag. There's certainly more flexibility with styles and options you can pick from with Apple's smartwatch. There's the three distinct models (Sport, Watch and Watch Edition) and it comes in two different sizes with a host of (unofficial) Watch straps and watch cases. 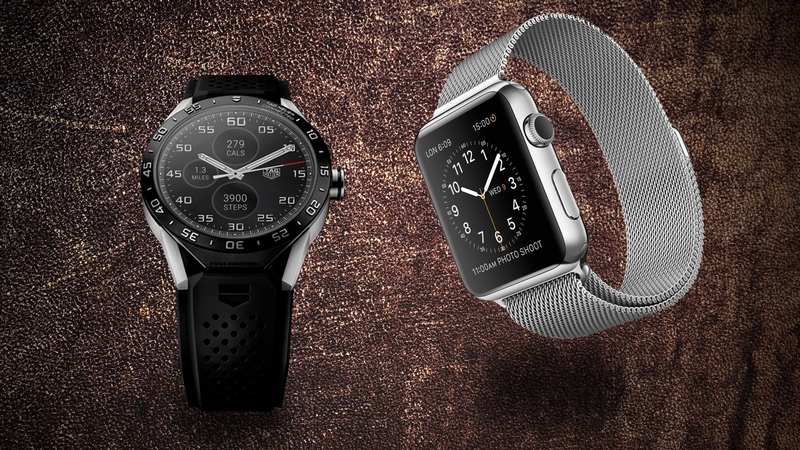 If you like your smartwatches stylish, there's even an Apple Watch Hermès Collection. Prices can go up well into their thousands if you want something really blingtastic though. For navigation, Apple has a lot more going on. There's the digital crown that's not like a crown on a traditional watch. You can use it to open the app launcher, but a twist will let you zoom into apps which is handy for maps. There's also the Force Touch-enabled screen, which means you can press a little harder to unlock more information from your apps. Interactions with the Connected are a little more basic and you'll spend most of your time tapping on the screen than anything else. If you care about your health, Apple does also include a heart rate monitor that will work with its own fitness apps and third party apps as well. There's no GPS onboard, but you can use your phone's GPS to track activities like outdoor runs or cycling. The Tag steers clear of adding any fitness focused hardware. If you want to use the Apple Watch, then you need an iPhone. The Connected is a little more flexible because it runs on Android Wear so is compatible with iPhones as well but you won't get the same experience when paired to an Android phone. If you've read any of our Android Wear smartwatch reviews in the past, then the experience on the Connected will feel very familiar. Aspects like Google Now and app support are both intact for instance. The key differences you will notice is that Google's smartwatch OS lives more in the background. if you want to tap into it, you can, but it feels like a far more sophisticated approach than what we've seen from LG, Motorola and Sony. A special mention should go to Tag's custom watch faces as well. Google has started to loosen the reigns on personalising watch faces, but Tag has clearly put a lot of work in keeping its options as detailed and stylish as the ones on its analogue watches. Over in the Apple corner, there's WatchOS, the company's operating system offspring of iOS. Unlike the short learning curve with an iPhone, the Apple Watch requires a bit more work. It's laden with more features than the Connected but getting to grips with how to find them or make best use of them does take time. What it does have in its favour is the app support with iOS developers quickly offering support and adding extra functionality to its existing apps. Notifications is pretty much the biggest reason that smartwatches exist right now. Taking you away from your smartphone so you can glance down on your wrist and decide whether you need to stare at the bigger screen in your pocket. Both the Tag and Apple Watch offer notification support but take significantly different approaches. On the one hand you have the Connected that keeps things discreet and hidden away within the watch face. Notifications are there if you want to deal with them, but they don't kill the traditional watch vibe that the Connected tries to maintain. Then there's the Apple Watch giving you all the notifications you'd want. Native and third party apps are supported along with Glances, which is essentially small widgets like the ones you get on an Android phone to give you bite-sized bits of information in real time. You can answer calls, tap into Siri and there's music playback control so you can switch up tracks when you can't get to your iPhone. Apple wins on support, but we'd be inclined to say that Tag nails it on simplicity and elegantly adding notifications to the mix. Smartwatch battery life on the whole is not great and if you're expecting wonders from the Watch and the Connected, then you're going to be disappointed. Unless you think reaching for the charger every night is no big deal. Tag claims the Connected should get you around 25 hours from its 410mAh battery and that's pretty much what we found with it. It's a quick charger at least although you will have to live with the fact like most smartwatches, that this is a proprietary charger. So keep hold of it. The Apple Watch is built to give you a few hours less than, specifically 18 hours depending on how you're using it. When we lived with it, we found it was between one (38mm model) and two (42mm) days of use. There's not that much between them for staying power, just don't expect to get a week out of them without touching the charger. Here's where things get interesting. The Apple Watch prices start at $299 but that can jump to anywhere near the $1,500 mark when you start looking at models like the Hermès Collection. Throw gold into the mix, and it gets even pricier. The Connected meanwhile is up there with the most expensive Apple Watch models and will cost you a not so wallet friendly $1,500. That's comfortably the most expensive Android Wear watch out there right now. If retaining that traditional watch design is what matters most to you, then the Tag is out in front. Timekeeping is the focal point and that also includes maintaining a look that style conscious watch wearers will appreciate. You're just going to have to be willing to pay for it just like you would a 'dumb' Tag watch. That's not to say Apple's smartwatch is some ugly beast and it has certainly raised the stakes, especially with designer tie-ups like the one with Hermès. It's certainly more feature packed and goes way beyond the Tag's smart. If you want a smartwatch does much more from your wrist, then this is certainly the one to go for.